Height: Over 15 inches (38.1 cm) at the highest point of the shoulders. Average height ranges between 21 to 27 inches at the shoulder, with females usually being on the lower end of the range. Weight: 45 to 65 lbs. The Poodle is well known as an intelligent, amusing, good natured and eager-to-please dog that makes a wonderful companion. Throughout the Poodle’s history, he has worked in several capacities, from cart pulling to circus dog, from sled-dog to therapy dog, from truffle dog to hand-warmer, from water retriever to gun dog, the Poodle can excel at just about any task given to him. Today, the Poodle is often seen competing in the show ring, in obedience, agility and in field trials. 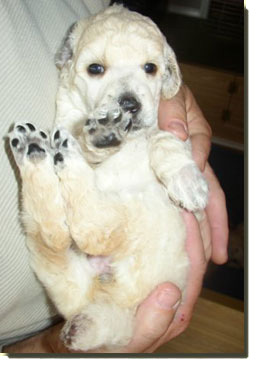 The Miniature and Toy varieties of Poodle were bred down from the larger Standard Poodles and all three exhibit the same general characteristics. In temperament, the Poodle is calm and steady and should never appear shy or sharp. He carries himself proudly with an air of distinction and nobility. The Poodle is an active breed and requires regular exercise. The Poodle’s coat is non-shedding, dense and of a harsh texture. Two distinct coat types exist — the Corded and Curly. The coat of a corded Poodle will normally start to cord between the ages of 9 to 18 months. Coat colour is any solid colour: black, brown, gray, apricot, cream or white. Note: The term Royal Standard Poodle is used to imply that the puppy will grow larger than the average Standard Poodle — This is not part of the breed standard. There are several theories of the Poodle’s origins and, while it is regarded as the National Dog of France, the breed’s actual roots may have come from Germany where he is known as the Pudel or Canis Familiaris Aquatius. The breed is also known as the “French Poodle” and the “Caniche.” The Standard Poodle’s original popularity was largely due to his fame as a Water Retriever. Ancient Egyptian and Roman artefacts depict the Poodle’s ancestors assisting their masters as game nets are brought in, retrieving various game from marshes, and herding animals. The Poodle is said to be related to the Portuguese Water Dog and the Irish Water Spaniel. The Standard Poodle is known to be the oldest of the three varieties, however, there is evidence that indicates the smaller types, the Miniature and Toy, were developed shortly after the Standard breed was established as he is recognized today. The Miniature and Toy varieties were developed as companion dogs and the Toys were said to serve as “hand-warmers” within the large sleeves of nobility during the Rennaissance period and from this, these and other small dogs, came to be known as “sleeve dogs.” From as far back as the early 1700s, Miniature and Toy Poodles became popular circus performers and, during the 19th century, Poodles were often seen working with gypsies and other travelling performers who trained them to perform tricks. Poodles were first brought to North America at the end of the 19th century but the breed did not become popular until after the second World War. By the mid 1950’s, and for about 20 years thereafter, the Poodle was the most popular breed in the United States. The clipping of the Poodle goes back to their working and sporting days when certain areas of the coat were shaved for added mobility when swimming as well as to prevent snagging and other areas were left covered for warmth. The wearing of a ribbon on the topknot is believed to have originated as a means to identify the dog when he was working in water. The travelling gypsies also added to the styles of clips for the performing Poodles who were often dressed in various costumes. Soon, it was discovered that the Poodle could be clipped, dyed and decorated in an endless number of styles. Addison’s Disease — Addison’s Disease is a disease where the adrenal glands secrete an insufficient amount of adrenal hormones. Initial symptoms include gastrointestinal problems, such as vomiting, lethargy and poor appetite. When an affected dog is stressed or when potassium levels are high enough to interfere with the heart, more severe symptoms may be seen including severe shock which can be fatal, heart arrythmias can occur or the heart could even stop. Bloat — Gastric Torsion (Gastric Dilatation Volvulus (GDV) — This condition is caused by a twisting of the stomach and thus trapping the stomach contents and gases resulting in a rapid swelling of the abdomen accompanied by pain and eventual death if untreated. It is a true emergency, requiring immediate veterinary action. This condition is most often seen in large, deep chested breeds. Anyone owning a deep chested breed, susceptible to Bloat should be prepared to handle the emergency procedures necessary, including having readily available the name and phone number of emergency clinics and/or who to call after hours. For more information on what you can do in the case of a Bloat emergency, see First Aid for Bloat in the Health & Nutrition section of the Canada’s Guide to Dogs website. Cancer — An estimated 40% of all Standard Poodle deaths are from cancer. Cushings Disease — There are three forms of Cushings Disease. Most dogs have the more common form, Pituitary Dependent PD, whereby the dogs have a slow growing form of cancer that is located in the pituitary gland. Epilepsy — A common cause of seizures in all three varieties of Poodles is “idiopathic epilepsy” which is commonly inherited. However, many factors can cause seizures besides idiopathic epilepsy and it is very important to have the dog diagnosed if seizures begin. Hip Dysplasia — Hip Dysplasia is a conditon in which the head of the femur fits improperly into the hip joint socket and is a common hereditary disorder found in many large breeds. Hip Dysplasia screening is recommended for breeding stock. Hypothyroidism — This is a condition resulting from an inadequate production of thyroid hormone and treated with medication. Symptoms include lethargy, obesity, excessive hunger, a coarse coat texture. Testing for thyroid malfunction is done through blood sample. Progressive Retinal Atrophy (PRA) — This is a genetic eye disorder which progresses gradually, resulting in blindness. The onset in the Poodle is between 5 and 6 years of age. The presence of PRA can be detected by ophthalmoscopic examination and screening by the CERF is strongly advised. Screening must be done annually. Sebaceous Adenitis — This is a chronic skin disorder resulting from abnormal and/or inflamed, or in some cases a total absence of, sebaceous glands. It is a major problem in the Poodle breed with estimates indicating that 50% of all Standard Poodles are carriers or affected. It can be misdiagnosed as hypothyroidism or allergies and, currently, there is no cure. All breeding animals should have an annual skin biopsy taken by a veterinarian. Von Willebrand’s Disease (vWD) — vWD is a blood disorder — a deficiency in clotting factor VIII antigen. Similar to hemophilia in humans, dogs affected by the disease do not effectively utilize their platelets for blood clotting and therefore are more likely to have excessive bleeding episodes upon injury. vWD is a common inherited disorder. A DNA test to detect vWD is available from VetGen. 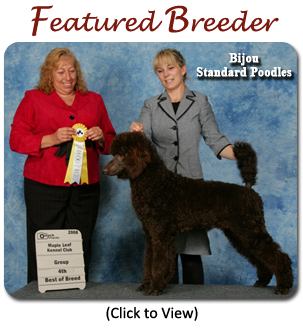 Canine Health Information Center (CHIC) — Standard Poodle Requirements — Providing a source of health information for owners, breeders, and scientists that will assist in breeding healthy dogs. CHIC is a centralized canine health database jointly sponsored by the AKC/Canine Health Foundation (AKC/CHF) and the Orthopedic Foundation for Animals (OFA). To keep the coat free of mats, frequent brushing and regular clipping is a must. Special care should be taken to keep the Poodle’s long, thickly feathered ears clean and free from infection. Ears should be cleaned weekly and the long hairs in the ear canal should also be gently pulled out regularly. The ear canal should also be swabbed with your finger wrapped in cotton moistened with Groomer or Veterinarian recommended ear cleaner on a regular basis. Versatility In Poodles, Inc — VIP is an organization devoted to Poodles with its primary purpose being to improve the health and promote the many talents of this remarkable breed.